Sid Raval chats about functional programming, strong types, and accessibility. The discussion touches on TypeScript, Haskell, Scala, Elm, as well as accessibility and developer tools. Thank you to CircleCI for sponsoring this episode. Chris is joined by Devon Zuegel who recently joined GitHub in the new Open Source Product Manager role. Devon and Chris discuss the complexities inherent to open source including funding models, managing motivation and burnout, different open source models, and end with a discussion around how we can be better open source citizens, both as consumers and maintainers. Thank you to CircleCI for sponsoring this episode. Alex Sullivan takes Chris on a tour of the mobile landscape comparing the core native platforms (the languages, developer tooling and IDEs, and fundamental thinking), React Native, and briefly touching on the newest entrant into the mobile space, Flutter. Thank you to CircleCI for sponsoring this episode. 182: What's it in the Service Of? Chris is joined by Eric Bailey, thoughtbot designer and champion for all things accessibility on the web. Chris & Eric chat about how Eric approaches accessibility and works to include it throughout the design process, design systems, functional CSS, CSS in JS, and more. On this episode of the Bike Shed, Chris is joined by thoughtbot CTO Joe Ferris. Chris & Joe start by talking about all things data. More and more we're building applications that need to manage medium to large data sets, combining data from multiple sources, and our approaches and frameworks need to evolve to match these needs. Joe provides the low down on how this can shape the way we build our applications. As part of the discussion around data they dig into the idea of event logs, most notably discussing Apache Kafka and it's unique approach to capturing state by storing an immutable event log, and the resulting architecture that falls out of this. Lastly they chat about the Scala language both in relation to data and streaming applications, but also more generally as an example of an approachable yet powerful strongly typed language. We're thrilled to welcome special guest John Resig, creator of jQuery and front-end architect at Khan Academy. Matt Sumner returns to chat with Chris about their recent adventures. They discuss Matt's ongoing work building an open source Ethereum implementation in Elixir, Chris's recent trip to speak at GraphQL Summit, and React Hooks. On this episode of the Bike Shed Chris is joined by Derek Prior, former thoughtbotter and previous host of this very podcast. Derek has recently moved on from thoughtbot to try out a new role as an engineering manager at GitHub. On this episode of the Bike Shed, Chris is joined by Christina Entcheva, developer from thoughtbot’s New York studio to discuss rails performance, user focused development, and headless CMSs. 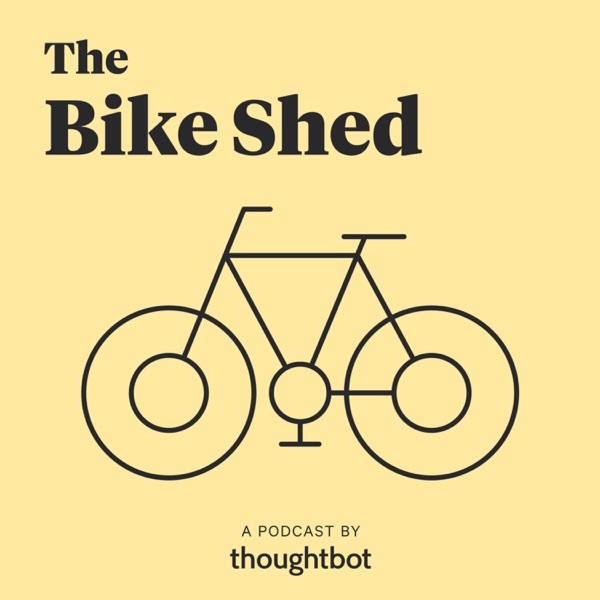 On this episode of the Bike Shed Chris is joined by George Brocklehurst, development director in thoughtbot's New York studio. The conversation starts with a discussion around progressive enhancement and the state of the modern web, and then shifts to focus on George's recent explorations of machine learning. This episode is a perfect introduction to the topic of ML, and provides a great summary of why you might want to start working with it and how to go about that. On this episode of the Bike Shed, Chris is joined by Josh Clayton, thoughtbot’s managing director in our Boston studio. Chris and Josh spend the episode discussing the various patterns and trends they see in the world of web development, covering languages and frameworks as well as more general patterns and approaches. In this special crossover episode, Chris is joined by Chad Pytel, Co-founder & CEO of thoughtbot and host of Giant Robots Smashing Into Other Giant Robots podcast, to discuss the content, history, and the process of making Upcase, thoughtbot's online learning platform, FREE. Joël Quenneville joins Chris to discuss Elm, the strongly typed functional programming language for writing reliable client side web apps. They discuss recent changes from the 0.19 release including reduced bundle size from dead code elimination, the somewhat controversial removal of custom operators. Anecdotally, Joël and team saw a reduction from 31.5K to 16.6K in bundle size going from 0.18 to 0.19 and felt no pain from the custom operators removal, so a big net win for them with this new version. Along the way Joël and Chris detour into the complexity of managing a project and community like Elm's and discuss Joel's recent work with the thoughtbot apprentice program. To round things out, Joël and Chris discuss the power of using a type system like Elm's to constrain the valid states of your application and make your apps more robust and maintainable. Steph Viccari joins Chris for a conversation starting with a discussion of some deployment and orchestration issues Chris was helping out with, followed by some of Steph's recent experiences with JSONB in postgres and the relative trade-offs of unstructured data. The heart of the conversation revolves around the core processes we use to develop software touching on sprint planning & story points, deadlines, the place for refactoring and code review in the regular cadence of development, and the often lamented retrospective meeting. 171: What If We Just Used a Form? Matt Sumner joins Chris for a discussion around Matt's recent adventures with the block chain and Ethereum, as well as tackling the thorny issue of server rendered vs client side apps. They cover a bit of history, a bit of opinion, and some practical considerations to keep in mind when tackling rich client development. Chris is joined by Paul Smith to discuss Crystal, a statically-typed and compiled language with a Ruby inspired syntax. Paul has spent much of the past few years exploring Crystal and building a new web framework called Lucky. Paul's infectious enthusiasm for the Crystal language shines through in this discussion covering some of the unique features of Crystal & Lucky, but there is plenty to enjoy even if you're not specifically interested in Crystal. With Lucky, Paul has done a great job of taking the best of what has been built in other frameworks and bring it to Crystal, drawing inspiration from Ruby & Rails, Elixir & Phoenix, and even PHP and the Laravel framework. There's something in this episode for everyone! Chris is joined by Kane Baccigalupi, development director from thoughtbot's San Francisco office to discuss Kane's history in government working for 18F and California State and how those experiences have informed Kane's work since. Throughout the conversation Chris and Kane discuss their shared desire to hide all implementation details and their love of Ruby for how it allows us to do that, testing vs test driven development, and approaches for refactoring large untested systems. Chris is joined by Rachel Mathew to discuss Rachel's recent experiences with Scala on a handful of client and side projects. They discuss the benefits of working within a type system, learning to work with a compiler, and the process of getting to know a new language and paradigm. Along they way they dip into the complexity of twitter as a platform for discussion and making improvements to development workflows. Chris is joined by German Velasco for a discussion ranging from German's recent transition to remote working to the wonders of the Elixir language and the Erlang platform, blockchain, Ethereum, TypeScript, the Language Server Protocol, and more! 166: Are Services the New Rewrite? Chris & Derek discuss the world of services, exploring the various forms SOA can take, the oft stated benefits, and some of the pitfalls they commonly see in the wild. The discussion ranges from alternative architectures, guidelines for how to think about services within your platform, and even includes an anecdote about thoughtbot's foray into the world of SOA on Upcase. Chris & Derek talk about beginnings and ends, borrowing from their consulting mindset for a conversation spanning CI, deployment, communication, team structure, and everything in between. After Sean confronts some breaking changes to Diesel, we discuss what we like about Visual Studio Code and how changing your tools can change your perspective. Sam Phippen joins us to discuss the maintenance burden of supporting old Rubies, service oriented architecture, and explorations of GraphQL and graph databases. Rails performance, rebalancing coherence, and themes from career advice requests. We're joined by Vaidehi Joshi to discuss her multimedia empire, conference talk prep, getting started with computer science, and the applicability of a computer science education in every day development work. We wrap the episode with live Q&A from our RailsConf audience. An ORM that's a pleasure to use with raw SQL when needed? Sean discusses how that can be. Plus, Derek shares a new and exciting way for migrations to break! We're joined by Aaron Patterson for puns. Aaron also updates us on compacting GC for Ruby and Ruby 2.6's JIT compiler before telling us how he really feels about functional programming. Chris Toomey joins Derek to talk about their shared experience in Elm and their excitement about GraphQL. Amanda is joined by Alex Sullivan, Android developer at thoughtbot, to discuss the state of React Native and its new competitor from Google, Flutter. Eileen Uchitelle joins us live from RailsConf to talk about exciting improvements coming to Rails 6, problems encountered by larger Rails apps, strategies for upgrading Rails and more! Is the bug in Postgres? Sean takes over operations of crates.io and keeps himself very busy. We also wrap up our experience at RailsConf. We catch up with Nick Means at RailsConf and discuss storytelling, "human error", advice for job seekers, and the idea of licensing software developers. Derek & Sean discuss their final preparations for RailsConf, the role of Diesel's schema.rs is in comparison to schema.rb in Rails, and how Derek took down production. Derek and Sean discuss ethical concerns in software development and the prospect of licensing software developers. Sean experiences a frustrating Ruby bug while building tooling to enforce module boundaries in Shopfiy's monolith. Derek deprecates Rails functionality instead of preparing his talk. Amanda and Sean discuss Flutter, modeling the game of baseball, and the state of persistence and networking in Android. 147: Is a Lambda a Sandwich? Derek shares his experiences with new features in Ruby 2.5 before we turn our ire towards daylight savings time and timezones once more. Amanda, Derek, and Sean discuss style guides, automated code formatting, and the cycle of disillusionment in development work. Derek and Sean commiserate about the latest generation of MacBooks, Slack, and the state of the Web. We talk about everyone's favorite Fisher-Price web framework and a small upcoming change to it before pivoting to discuss Derek's experience with his first Elm PR. We discuss the challenges in parallelizing development work and also take a look at what's coming soon in Rails 5.2. 140: A Sign of... Stability? Sean and Derek argue the semantics of versioning and opine for automated reporting on more structured changelogs as a feature of future package managers. Derek is joined by coworker Sean Doyle and Codecademy’s Alex Clark to discuss the process of test-driven development and the development of a new TDD course for Codecademy. We chat about how shared global state in tests can cause you to doubt foundational truths of the universe, some issues with Rails system tests, and recent changes in browser behavior. Who should library documentation be written for? How do you, as an author, know what your users will need to know? Should you have long form guides in addition to API documentation? We ask and answer these questions in the context of Sean's work to document Diesel 1.0. Stick around for the spoiler-filled after show about Star Wars: The Last Jedi. Amanda joins Derek to discuss KotlinConf, powerful IDEs, our Ralphapalooza hackathon, and the React Native experience from a native mobile developer's perspective. We discuss a possible ActiveRecord bug Derek encountered and explore the ambiguity of SQL formatting best practices. We share our favorite talks from RubyConf and discuss how Sean has made ActiveRecord attributes allocation significantly faster with Rust. Sean is on to a significant ActiveRecord optimization using an extension written in Rust and Derek shares an overdue thanks to an excellent manager. We discuss patterns and anti-patterns encountered in agile retrospectives and revisit a favorite topic: form objects. We briefly discuss the renaming of factory_girl to factory_bot before diving in to the visitor pattern; what is it, and what are its inherent tradeoffs. Is Database Cleaner necessary anymore? Tune in for our exciting play-by-play reporting on that issue and stick around for chatter on personal defaults for new Rails applications. 129: You Wanna Talk About GraphQL? We discuss an issue in the interaction between Rails, Chrome, and the HTTP referrer policy before Derek shares his love for GraphQL. 128: And Now for My Next Trick! We discuss strategies for fighting back against project management overhead, refactoring workflows, and on-call rotations. We discuss Bundler warning us to update to a prerelease version and other recent annoyances with our favorite dependency manager. We also wonder what GitHub diff stats can tell you about your contributions to a project and when they might be a smell. Stick around post credits for some spoiler-filled chatter about the first couple episodes of Star Trek: Discovery. We discuss a major change to Diesel's insert statements in advance of its 1.0 release and reexamine Contracts.ruby after Derek spends some time with it in use. We share and discuss some user feedback on fakes and mocks, discuss the benefits and drawbacks to FactoryGirl and share exasperation over the handling of the Equifax data breach. 124: Nope. Nope. Nope. Nope. We go inside the RubyConf CFP review process before turning our attention to questions about the impact of code review. Stick around post credits for some spoiler-filled, lukewarm Game of Thrones takes. Derek and Sean discuss the troubles encountered when code reuse is a goal above all others and strategies to have your reusable cake and eat it too. Derek and Sean discuss going from zero to code on new projects, writing tests that deal with external services, and a tricky floating point precision bug Sean encountered in ActiveRecord. The Changelog's Jerod Santos joins the show to talk finding time for, sustaining, and funding open source development. We do some follow-up on open source fundraising and discuss some interesting patterns in Derek's new client project. Sean and Derek are joined by Caleb Thompson and Matthew Mongeau for our annual live episode to discuss lessons learned from past projects, and speaking at conferences. We discuss the economics of remote work, ActionDispatch::SystemTest in RSpec, and the use of Patreon on open source projects. We chat with Justin Searls about testing, programmer personality types, programming communities, and putting spreadsheets on the Internet. Amanda is joined by SF thoughtbot developers Tony, Josh, & Greg to discuss learning new languages (and whether developers should do that in their free time), machine learning, the future of AR/VR, and tech that strives to make a social difference. We talk with Cecy Correa about how to hire and get hired. We discuss a tiny DOS caused when upgrading thoughtbot.com to Rails 5.1 and how Rails could better surface warnings that only occur in your production configuration. We also get an update on multi-table joins in Rust. We talk to Matt Casper about contributing to Diesel, Rust's ecosystem, and the next big thing. 112: Lifecycles Are Dead, Long Live Lifecycles! Amanda joins Sean to discuss all the Android news to come out of Google I/O, Kotlin as a "first class language", and features of Android "O"! We talk with Aaron Patterson about Ruby and Rails upgrades, and the goal of making Ruby 3 three times faster than Ruby 2. What’s the deal with green potato chips? Also: RailsConf wrap up and an AST pass refactor for Diesel. Follow up about Service Objects and Computer Engineering. Plus, RailsConf prep, code slide woes, and modal pop-ups. 108: Have You Tried Rebooting? Is your operating system hosed? That might be related to Rails! We also chat about the trend towards compiled languages. Single table inheritance, polymorphic associations, state machines and service objects, oh my! Chris Toomey joins to talk about Tell Me When It Closes, Haskell, and GraphQL. Complexity vs Functionality, Validations vs Database Constraints, plus whatever a Cap'n Proto is. 104: It's Dangerous to Refactor Alone! Google's carrot-and-stick HTTPS policies and how playing The Legend of Zelda is like refactoring. When a hash isn't a hash, GitHub as your Résumé, and porting Crates.io to Diesel. Going "to" the moon, hidden type errors in our Rails apps, the process of talk prep, and the S3 outage. Amanda and Sean discuss the evolving stages of open source projects, native apps vs web apps, and space. Sam Phippen helps us celebrate episode 100, as we discuss Diesel bugs, REST, RPC, and more. We go into the weeds with MySQL and discuss the virtues of database migrations written in SQL. We discuss complexity and progressive disclosure, garbage collection, and the impenetrable nature of Git. We wonder why writing parameterized associations in Rails is not easy, and discuss the difficulty in eliminating no-op queries in ActiveRecord. Plus, we discuss how you can give a great RailsConf talk proposal that doesn't have anything to do with Rails. Baby Ruby, Ruby refinements, Rails discoverability, and annoying polyfills. Amanda is joined by Morgane Santos to discuss the experiences, technology, and development of Virtual Reality. We discuss the pain of custom inputs in HTML, ActiveRecord bugs, and Rust's Fire Flower. The impact of codes of conduct on community behavior, shipping a mobile app written in Elm, and yet more to say on SemVer. We discuss the sneaky performance differences between present?, any?, blank? and empty? with ActiveRecord, when N+1 is a "feature", and the future of Diesel. Derek briefly complains of the staleness of the asset pipeline in Rails 5, before Sean catches Derek up on Rails 5.1's support for Webpack, Yarn, and ES6. We also discuss the pain of deprecations in the upgrade to Rails 5. We discuss adventures with shared mutable state in Elixir before turning to our thoughts on mocking HTTP interaction and how our approaches may differ depending on the language we’re using. Ashley Williams joins the show to discuss NPM, Yarn, and the general package manager ecosystem. Derek chats with Ian Anderson about developing a mobile app for iOS and Android with React Native. 84: Why Are Manhole Covers Round? What do we look for when reviewing job applications, interviewing candidates, and pairing with prospective co-workers? Sean encounters a roadblock in updating Diesel to use Rust’s new soon-to-be-stabilized procedural macros. Derek and Sean discuss the most recent CVE filed for Bundler, which is a lot like the previous CVE filed for Bundler. 81: Is This Really a CVE? Derek and Sean talk through how to handle a security vulnerability that was reported for Clearance, a user authentication library. Derek and Sean talk through some complex SQL before they examine the calluses developed from years of writing software on OS X.
Sean and Amanda discuss the state of Android Development in 2016. Java, Kotlin, Dependency Injection, and Functional Reactive Programming, oh my! How can you get your open source pull request merged? Between thoughtbot's Summer Summit and Sean's vacation, we are sadly without a new episode this week. However, we would love you all to check out thoughtbot's newest podcast, interviewing inspirational designers, developers, and other makers in tech, The Laila & Brenda Show! Give their latest episode a listen here, and if you like it subscribe to their feed however you listen to podcasts! Derek and Sean discuss hunting down intermittently failing tests, finding unused code in your application, and why you should never ever change your test framework. We talk through design considerations for a user-visible custom query builder for a high volume ecommerce system. We discuss Pokémon Go and what its success might mean for software developers before Sean lays out his case for replacing the pg gem and libpq. Inspired by Nickolas Means’ fantastic RailsConf keynote, we discuss the corollaries between Lockheed Martin’s Skunk Works projects and our software development projects. Sandi Metz joins us live from RailsConf to talk about the rules, the trouble with naming things, making the right kinds of errors, and conference speaking. A big thanks to everyone who came out to our live show! A video version of this episode is available on the thoughtbot YouTube Page. Sean runs through a Rails bug that sits at the intersection of several magical and confusing Rails features. Leading Rails contributor Rafael Franca joins us from RailsConf to talk about taking over Sprockets, the future of the asset pipeline in Rails, managing Rails dependencies, and the hard work of software maintenance. Also, Sean said you'd all "definitely" have the final build of Rails 5 by now. Whoops! We talk with Terence Lee of Heroku, Bundler, and mruby-cli fame about Apache Kafka and the future of mruby scripting. While at RailsConf, we talk with Katrina Owen about finding metaphors for software development, the successes and mistakes of Exercism.io, and the benefits of providing code reviews. Open Mic is back by popular demand, this time in San Francisco. We hear from developers in thoughtbot's San Francisco office about their recent investment time projects. Derek and Sean discuss some recent issues with exciting language features like pattern matching, macros, and static types. Sean celebrates Diesel reaching "faster than a SQL string" status before we chat about Rails 5 blockers and the clarity of focus and priorities that only shipping can bring. "Send me an email every year for my birthday" is an easy thing for a human to understand but it can be deceptively tricky to do with computers. Also tricky for (some) computers: SELECT * FROM <empty_table>. Wait... what? KF (Katherine Fellows) joins the show to chat about successful BridgeFoundry events and creating environments where remote developers, junior and otherwise, can thrive. Should you rewrite or refactor? What should you consider as you weigh this decision and what exactly constitutes a rewrite anyway? Derek and Sean talk about their experience with the Rails 5 betas, how to test against them today, and things that you might want to look out for when updating your app. Derek shares some Elixir annoyances with Sean and they discus how a consulting role colors their perception of languages and frameworks, both for better and for worse. Sean provides an update on SQLite and Association support in Diesel. Laila and Derek go on a tour of the various caching mechanisms available to web applications in general, and Rails specifically. When is the right time to cache and at what level? We enjoy a wide-ranging discussion with Steve Klabnik on the importance of good documentation, the sometimes cloudy definition of a breaking change, the politics of open source contributions, and work/life balance or boundaries. It's Open Mic day at The Bike Shed. We hear from other thoughtbot designers and developers about what they're excited to be spending their investment time on lately. We discuss the maintenance burden of ActionCable and its dependencies on Rails 5, follow-up on Scenic issues, and discuss implementing migrations anew in Diesel. Derek shipped Scenic 1.0, which spurs a conversation about semantic versioning and the value of the 1.0 milestone. We discuss what the bar for breaking changes in a library should be and look at some specific changes on tap for Scenic and whether they will or should carry a major version bump. Sean has shipped early versions of Diesel, an ORM for Rust! We discuss its semantic versioning, the ergonomics of use versus the complexities of implementation, early issues with the API and the road to Diesel 1.0. We talk about lessons learned from teachable moments both in the moment and decades later. We speak to Grayson Wright about building Administrate, an open source Rails framework for administrative interfaces. What makes Administrate different than existing solutions and what are the challenges in maintaining high-level dependencies. Derek and Sean talk about Derek's exploration into Elixir and Phoenix, when and how performance matters, and ways to keep your Rails app fast from day 1. The ActiveRecord update API is a mess of methods that confuse even ActiveRecord’s maintainer. What are the problems and is there any hope for a solution? We talk with Yehuda Katz about how much risk is right for you and your app, the sharp tools of high level abstractions, and how our statistical intuition leads us astray on web performance. Laila and Derek discuss how they have handled forms with complex validation requirements and how to make these forms have a smooth user experience. Begun, the ad block wars have. Derek debugs an issue that arises from iOS ad blocking and wonders if analytics will move back to the server side. Sean fills us in on how dirty checking works in ActiveRecord and how he's making it faster and better in Rails 5. Derek and Laila talk about learning Python and Django and discuss how thoughtbot adopts new languages, frameworks, and libraries. What factors influence adoption? How do we share what works and doesn't work? Sean and Derek explain why you should always use a personal email address in your Git configuration before they dive into Ruby exception handling, and potential MRI proc optimizations. Derek is joined by Laila Winner to discuss Neo4j, the importance of fantastic documentation, and the different types of documentation a project requires. Derek and Sean discuss Microsoft's interest in open source, improving the Rails development story on Windows, and Sean's progress implementing an ORM in Rust. Are provably correct queries of interest to you? Sean gives a rundown of what a Rusty ORM might be like to build. Derek and Sean discuss hypothetical changes to Rails routing before turning their attention toward hunting memory bloat and the proposal that strings be frozen by default in Ruby 3. Sean is joined by Mike Burns to discuss what Ruby and Rails can learn from Python and Django. Did you know Rails has no integration test suite? What could go wrong? Sean and Derek circle back on HTTP before diving into unsafe rust, and finally the merits of a small standard library. This week, Sean and Derek discuss performance and inheriting code. In a stroke of complete madness, Derek decides that turbolinks isn't that bad. Derek is joined by Gordon Fontenot for a discussion of the JSON API specification, problems consuming it from Swift, and the future of functional programming in Swift. This episode of The Bike Shed is sponsored by Code School. Entertaining online learning for existing and aspiring developers. Leave a review on our iTunes page to be entered to win a free month of Code School. Richard Schneeman joins The Bike Shed to discuss ruby memory use, horizontal scaling, and tackling open source issues big and small. This episode of The Bike Shed is sponsored by Code School. Entertaining online learning for existing and aspiring developers. Leave a review on our iTunes page to be entered to win a free month of Code School. Sean gives Derek a tour of Rust, a new systems language from Mozilla. This episode of The Bike Shed is sponsored by Code School. Entertaining online learning for existing and aspiring developers. Leave a review on our iTunes page to be entered to win a free month of Code School. Eileen Uchitelle joins the show to discuss performance improvements to ActiveRecord, speeding up integration tests, and contributing to or running open source projects. This episode of The Bike Shed is sponsored by Code School. Entertaining online learning for existing and aspiring developers. Leave a review on our iTunes page to be entered to win a free month of Code School. Rails Core Team member Godfrey Chan joins the show to demystify rails bug hunting and contributing. We're joined by Josh Clayton to discuss our differing strategies on testing view behavior, strategies for dealing with brittle feature specs, and what types of tests each of us favor. Derek and Sean are joined by Sam Phippen from the RSpec core team to discuss RSpec mocks, testing strategies, and minitest. Sean and Derek discuss rails asset dependencies before diving into an overview of animation techniques and C extensions. We chat with Sam Saffron about performance, benchmarking, and database migration strategies. Sean, Derek, and Sarah Mei talk about conference speaking, refactoring, and OO vs FP problems. This week, we're joined by DHH and discuss microservices, monoliths, shared abstractions, and the fate of Action Cable. Live from RailsConf, Aaron Patterson joins the show to talk about Rails 5, Rack 2, Contributing to Open Source, and cats. We also field audience questions. Derek and Sean talk about naming, debugging, and the anxiety of conference talks. Sean and Derek talk about the state of Android tooling, refactoring journeys, and an approach to rails form objects. Pat Brisbin joins Derek to discuss the many advantages of Haskell programming. Sean and Derek discuss Monoliths, Service Oriented Architecture, and the new Adapter Specific Type Registry in Rails 5. Derek and Sean discuss hunting Rails performance regressions and techniques for improving performance in your web applications. Sean and Derek take a fresh look at the tradeoffs in writing CoffeeScript and whether we should be using an ES6 transpiler instead. Derek and Sean discuss Sean's commit access to Rails, what's coming in Rails 4.2, and how to go about making Rails code better.